Growth of Small Business is Our Core value. Most of our clients, especially those small businesses we’ve been partnering with for nearly four decades have leveraged our work. To understand why we encourage them do that, here’s the reason I started Venmark in November, 1976. The following graphic resulted from a six week exercise with the book “Where do I go From Here in my Life.” It was a real life-changer and the five points are more important today than they were 38+ years ago when I wrote them. Having vision is essential for marketing success. 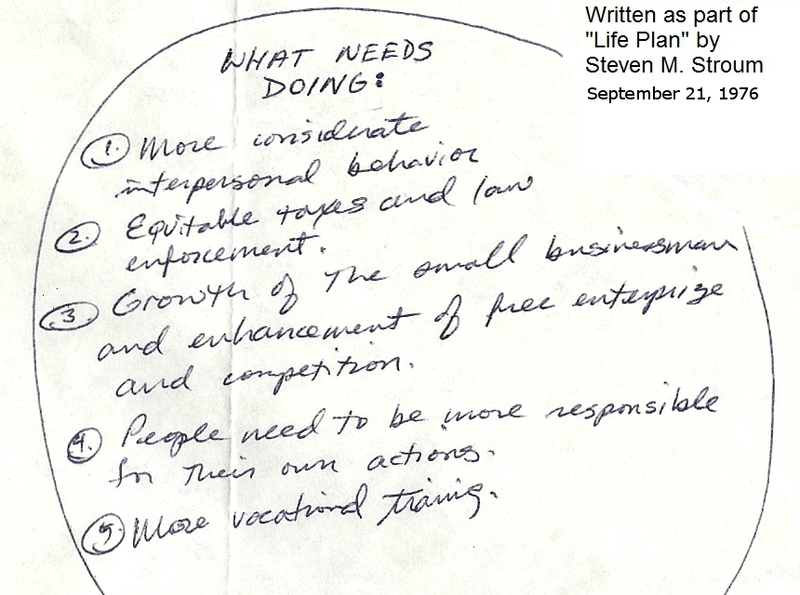 Just in case you can’t read my handwriting, #3 is GROWTH OF THE SMALL BUSINESSMAN AND ENHANCEMENT OF FREE ENTERPRISE AND COMPETITION. My commitment to these core beliefs has been critical to our success at Venmark International and the work we’ve done on behalf of small business. Product publicity is incredibly misunderstood. Basically, publicity is news and editorial content which is the reason why a media outlet exists. Unlike paid advertising, where the sponsor of the message is identified, product news is an equalizer. You cannot distinguish the size of a company by the news coverage it receives. News, for the most part, is objective. I have made tiny, one-person businesses look as prominent as Sony or IBM! They’ve shared the front covers of leading technical publications. So, not only have I created a business model which lets small companies take full-advantage of their publicity opportunities and share the same news pages as big companies, but Venmark has also mastered the art and science of using product publicity to achieve specific marketing goals. Thankfully, the internet has turned out to be like a 50,000 Watt amplifier! It has expanded the impact of our publicity efforts on behalf of clients. Today our publicity strategies are designed to leverage the impact of web search too. It is not unusual for our clients to get published 150 times on the internet and place extremely high in organic search results as a result of one of our product news releases. Yes, a great deal can be accomplished for small businesses by using publicity as an integrated marketing tool. This has allowed our small B2B clients to compete with large, well established companies and attract OEMs and distributors for their products and services. And support those distributors too. At Venmark International we have created many situations where clients have received orders they can trace back to our product news releases. We have a letter on file from a client who received a $35,000.00 order from Chile and wrote us that we were responsible for the order and they were happy not to have to pay a commission to an agent! That same client, by the way, began selling internationally many years ago and only accepted orders via American Express at first. That policy helped eliminate some of the risks he feared early on. Today that client has distributors all over the world who generate millions in sales annually. In sum, we are committed to helping small businesses get the best marketing return-on-investment and, therefore, be more competitive and enhance our free-enterprise system. Keep in mind, small business is the nation’s largest job creator and represents our core values of individual responsibility and free-enterprise.